Another variety: Nuphar polysepalum is also called pond lily. On Klamath Marsh are about 10,000 acres of this great golden water lily. It was formerly harvested by the Native American women with dugouts poling slowly along, and pulling the pods off their stems. The days harvest was brought to shore and emptied into a hole where fermentation ensued for weeks or until the end of the season, when the heap was stirred up and the best seeds brought up and dried and subsequently roasted. When ground, these seeds make a fine cereal, but the preparation is difficult. “Wokas”, Klamath is the name. 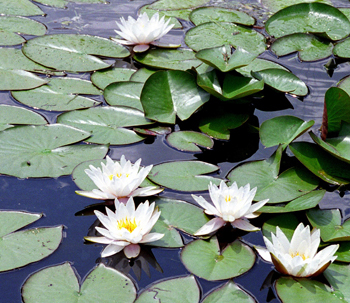 The Water Lily of China is Euryal ferox, called Ch’ien-shih. Used medicinally for gonorrhea, spermatorrhea, polyuria, etc. Nymphaea odorata: The water lily takes its genus name, Nymphaea, from the Greek numphe, meaning “water nymph” or “virgin”. The Greeks are said to have given the flower this name because of its reputed anti-aphrodisiac qualities. Poets and artists through the ages have also associated a virginal aloofness with water lilies, especially the white-flowered ones. The plant has often been used as a symbol of purity and chastity, for the water lily flower holds itself erect as if disdaining to touch the murky water surrounding it. As long as 5,000 years ago, the lotus flower, whose different varieties are members of the water lily family, was one of the most important symbolic and religious plants in both the Near East and the Orient. In Egypt the lotus symbolized the fertility of the rich soil of the Nile’s yearly inundation on which the prosperity of Egypt depended. Lotus blossoms were often placed on statues of Osiris, the god of vegetation and regeneration. The lotus was also a symbol of immortality, an attribute to both Osiris and his son Horus, god of light and the sun. Horus is sometimes pictured in Egyptian art sitting on a lotus blossom. In Persia the lotus also symbolized the sun and light. The lotus has similarly been a major symbol in the culture of India. Brahma, the Hindu god who created the universe, issued forth out of a lotus blossom and, like the Egyptian Horus, is often pictured sitting on the flower. Many of India’s spiritual ideas are linked with the lotus. For example, the state of samadhi, or spiritual ecstasy, in yoga is represented by a thousand-petaled lotus flower. Indian Buddhists claim the lotus for a symbol of Buddha also, because the flower is supposed to have sprung up to announce his birth. Chinese Buddhists consider the lotus as Buddha’s footprint, and their concept of heaven features a sacred lake of lotuses.